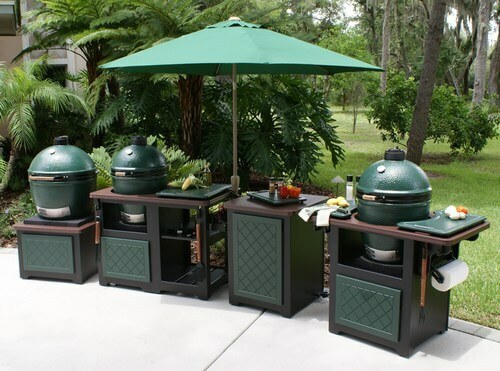 Although the Big Green Egg has been available since the 70’s, and the kamado style cooker has existed for thousands of years, Big Green Eggs are becoming increasingly popular. With the outdoor kitchen trend growing year after year, people are discovering new ways of cooking better-than-restarurant quality food at home. Many are finding that with a limited budget, a versatile grill like the Big Green Egg can function like many different grills, all in one. It can sear steaks on direct heat, slow cook foods, smoke foods, even cooks excellent pizza as an outdoor pizza oven. To match the trend, numerous companies are developing products to complement the Big Green Egg. Werever Products has a line of movable carts, tables, and storage cabinets to help homeowners get the most out of their backyard barbeque cooking. Also, new brands are entering the market with similar attributes as the Big Green Egg. Brands include the Kamado Joe, Primo, and most recently the Comet Kamado. Werever’s Big Green Egg Tables are built from the same marine quality High Density Polyethylene that our outdoor kitchen cabinetry uses. UPDATE: Werever has discontinued their line of movable Big Green Egg tables and carts. 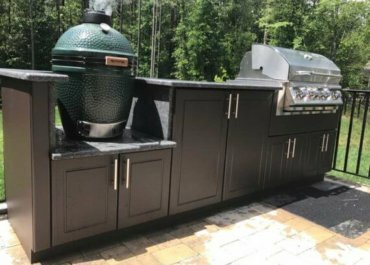 We do build cabinets for built in Big Green Eggs and other brands of kamado style cookers.